Our range of Butterfly 100% cotton yarn is sourced direct from the manufacturers in Greece and offers high price quality at low quality prices. Butterfly cotton comes in two weights, Super 10 and Super 20. Super 10 is a DK weight yarn and is supplied in 125 gramme skeins (230m/skein). Super 10 is a high quality yarn that is soft to the touch and excellent at holding its shape. It is perfect for all types of knitting, but is specially good for textured garments. Super 20 is lighter than Super 10, but has the same features. It is supplied in 125 gramme skeins at 330m/skein. Super 20 is used in our Shawl Knitting Kits. A recent addition to our yarn stock is a range of 100% wool from West Yorkshire Spinners. We have Blue Faced Leicester aran weight and a lovely ecru spun from Wensleydale fleece in DK. We also have BlueFfaced Leicester in Country Bird aran weight. 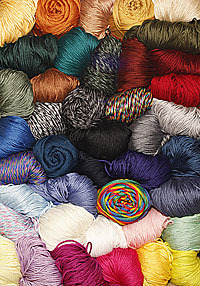 Our latest product range is also from West Yorkshire Spinners and is our first foray into 4-ply sock yarns. We offer two ranges, both of which are a blend of wool, inclusing 35% Blue Faced Leicester, and nylon.